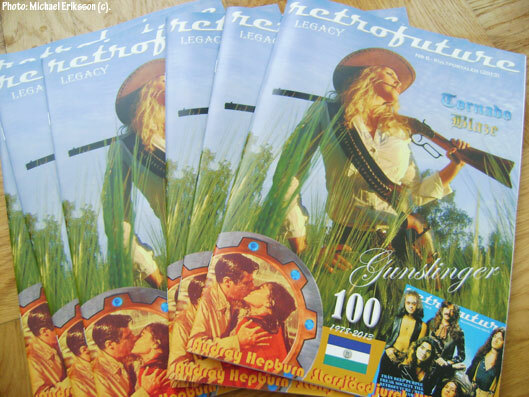 The 60 page RETROFUTURE 6 (Western edition) has arrived from the printers. So this is it – the 100th anniversary double issue is finally out. The 44 page Purple edition arrived earlier this summer and it is nice to finally have it all. This one took a lot of work, but seeing it now it was all worth it. Just look at that western image on the cover, with model Ellinor Nordbakk posing as Tornado Blaze. You never see that kind of thing anymore. I am proud of this issue. Got a package from the Tommy Bolin Estate today, courtesy of Johnnie Bolin and Trace Keane. CD´s, shirts, buttons etc. This will be handed out for free to visitors of the upcoming Deep Purple party here in Östersund (Sweden) on November 23 at Jane Doe (see earlier posts for details). I may ask the gals who serve drinks to wear the shirts, we will see. There is going to be plenty of Tommy Bolin related stuff on this night, I think it will be a night to remember. Today I have also prepared a greeting for the tables – a few words to the people that take part of the festivities. It sports a shot by Trace Keane taken at the Sioux City Museum (see earlier post) in which RETROFUTURE 6 (Purple edition) can be seen. On the opposit side there will be an A4 sized reproduction of the poster for the event (see earlier post). As for the posters, these will be put up around town in November as the party is closing in. Today I am happy to announce that there will be a Deep Purple party in Östersund (Jämtland) on November 23 (a Saturday). The place is the recently established rock club Jane Doe. The real festivities begins at 19.00 although dinner guests that arrive earlier will be able to hear related music but a tad quieter. The party wraps up at 02.00. Age limit is 21 at Jane Doe. There will not be a band but DJ´s will play Purple Family stuff all night long. One hour will be devoted to the music of Tommy Bolin (Billy Cobham, James Gang etc). Since the party is connected in spirit to the festivities that took place in Sioux City in early August, the evening is dedicated to Tommy and the memory of Deep Purple MK4. An article that features both events will be printed in RETROFUTURE 7 next year – so if you pop up you better be ready to smile at the camera if somebody asks you to! 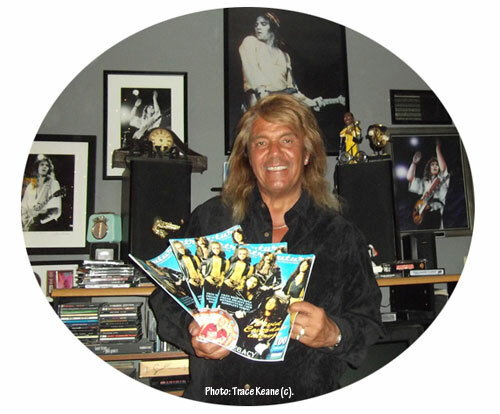 This is a picture of Johnnie Bolin, Tommy´s brother. He is featured in RETROFUTURE 6 (Purple edition) and 100 copies was sent to Sioux City for the Bolin nights they had a few months ago. 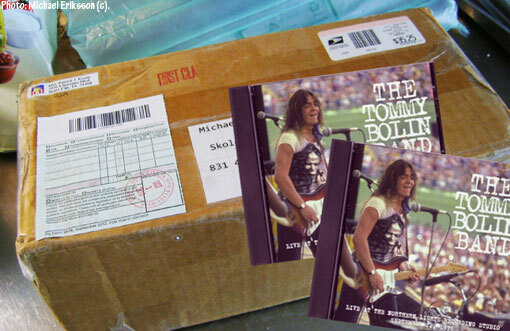 A few Tommy Bolin things will be given out to the guests at our party during the evening, sent from him. Two special drinks, created for this party, will be served to interested guests. They are called “Deep Purple” (you can guess the colour!) and “Lady Luck” (reddish, inspired by the “Come Taste The Band” cover). 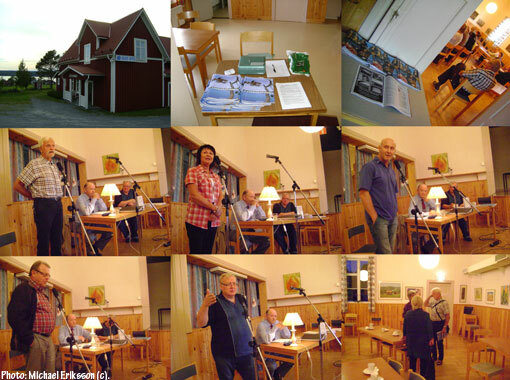 Free books, CD´s, DVD´s etc will be given out during the party. A guest that buys a beer or a drink may suddenly be handed a little bonus like this. To get a gift is not a right, it is an extra bonus if you are lucky. Chances are not bad though. These gifts comes from myself and certain record companies etc, including Deep Purple (Overseas). Details in RETROFUTURE 7 next year. 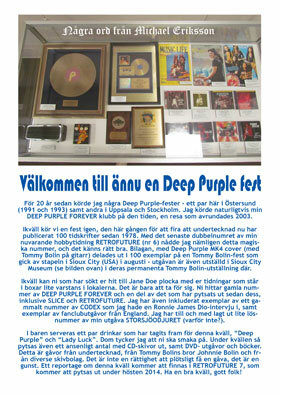 Backissues of DEEP PURPLE FOREVER and RETROFUTURE (and some other titles) will be available to pick up free of charge. You can walk away with 10-15 different magazines should you want to. For fans of the Deep Purple Family, this will be a night to remember. So let us all have a good time as we celebrate the loudest music on the planet – at Jane Doe, the best place in town! Well, it took me precisely one month to head out with the remaining RETROFUTURE flyers (see earlier posts for details), but I managed to complete the task today. I chose the location for maximum effect, a university called Mittenuniversitetet. Plenty of students around, and they can pick up the free magazines at a library quite close by. The Fall season has begun. Here is another exclusive preview from the RETROFUTURE 6 (Western edition) issue – my western heroine Montana Blue in the eyes of artist Scott King. A wonderful guest appearance from an artist that was part of my operations between 2000 and 2004. I asked Scott last year if he wanted to be part of my 100th publication, and he was interested in having a go at my Montana Blue creation, giving it his own personal touch. As you can see, the result is breathtaking – Scott really is in a class of his own. This page will be published with the interview I present with Montana Blue model Nina in this issue, adding yet another twist to the project. I originally contacted Scott King for my LUCY IN THE SKY magazine in 2000, after spotting his wonderful art online. He became a part of this publication and had pages in the five issues that came out between 2000 and 2003, with an interview about his work in the final issue as well. As I moved into the SLICE operation in 2003 Scott continued to be part of this publication as well for the first couple of issues – SLICE 2003 and SLICE 2004. But not only with the Xena art, but with additional X-Files art to boot. It was a wonderful addition to what was a very exciting part of my publishing career. 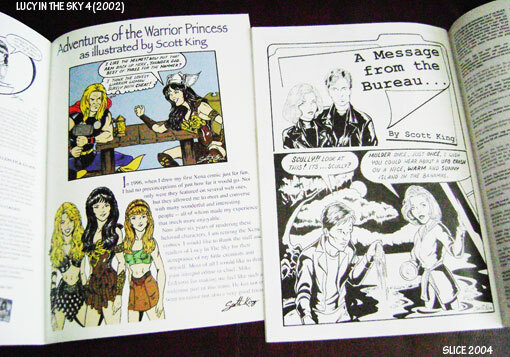 The “Adventures of the Warrior Princess” and “A Message from the Bureau” pages are classics now, in my humble opinion. I would like to think that they are remembered fondly by the people that collected my magazines at the time. When I browse these publications now myself, I just love these pages – this really is some of the best stuff of its kind. The satire reminds me of classic MAD. I am so happy that Scott King is part of the celebrations this year.